Following on from the Golf Course Superintendent’s News Letter sent to you in March, which was designed to keep you up to date with all of the important maintenance procedures which were scheduled to take place on The Indiana Course, we are pleased to be able to give you an update on the works carried out and to inform you of the schedule of works which shall take place in April 2019. The grass at the back of the 1st green has been replaced with new Bermuda turf. The turf is partially dormant hence it’s yellow appearance. During the next few months it will ‘green up’ as temperatures rise. Using Bermuda grass will allow for a higher quality of grass to establish on this steep and south facing slope. The area is currently roped off and marked as GUR. The fairways on holes, 1, 3, 4, 6, 7, 9, 13, 15, 17 and 18 have been hollowed cored and sand topdressed as part of the spring aeration program. Disruption to play as always was kept to an absolute minimum. The hollow coring of the greens scheduled for 18th March was deferred until the next scheduled date on 7th May. However, the putting green was hollowed cored to help recovery from the salt damage to the lower level of the green surface. The hollow coring, topdressing and overseeding of all green approaches has been completed on holes of 3, 5, 7, 9, 12, and the putting and chipping green as per the maintenance schedule. The maintenance teams have been busy with numerous projects around the golf course. This has included the cleaning out and introduction of gravel mulch to the planting areas around the academy area, the cleaning of the river and landscaping interface to La Rosa along the 18th hole, as well as the pruning and cleaning of the planting areas around the Club House. The team has now started to clear the river behind the 3rd green. As sand is continuously deposited outside of the bunkers by wind or golf shots, creating an area where grass cannot thrive in the summer months due to the very fast percolation rates of the pure bunker sand, the excess sand will be removed from the bunker faces and the bunker surrounds and rebuilt to its original soil level. New turf will be placed and established to enhance the playability and improve maintenance of these areas. New plant material will be introduced around the golf course as we start to clear the stock held at our cactus nursery in Las Cunas. Some of the cactus are very big and will be transported onto the golf course with trucks. Disruption to play will be keep to an absolute minimum. Additional rabbit fences will be added to the golf course boundary to reduce the damage made by rabbits on the fairways and green surrounds. The rabbit capture company has now completed two months on site and will return to the golf course in a month’s time to continue with the capture program. The remaining fairways on holes 5, 10, 11, and 16 will be hollow cored and sand topdressed as part of the spring aeration program. This particular aspect of golf course maintenance is both extremely necessary and time consuming, so we ask you to please bear with us until its completion. Disruption to play as always will be kept to an absolute minimum. In the knowledge that all Property Owners and Members need to have as much notice as possible concerning particular aspects of the golf course maintenance schedule that may temporarily affect the playing conditions of the green’s surface, thus enabling them to plan particular holidays accordingly, please see below the remaining hollow coring dates in 2019. In addition, the Putting Green, Chipping Green and Driving Range Facility will be closed for hollow coring on Wednesday 9th May & Wednesday 25th September 2019. 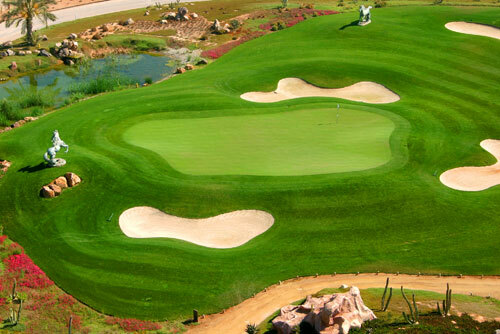 You will be able to keep up to date with the full tournament and social calendar, format and any additions, information of how to enter, and much much more, by visiting either our official website www.desertspringsresort.es or by contacting the golf reception at Desert Springs. We and the staff at Desert Springs look forward to seeing you on The Indiana course in the near future.